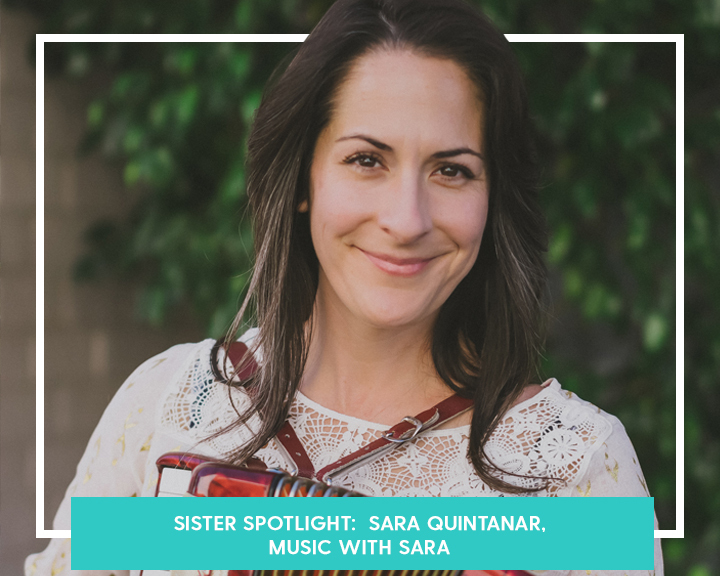 Sara Quintanar is the founder of Music with Sara, her mission is to make early childhood music education accessible to more families and educators. She is a bilingual early childhood music educator based in Los Angeles, California. She teaches music in Spanish to hundreds of children each week. She is also a mother of 3 children ages 12,10 and 5. Her family comes from East Los Angeles, and from Monterrey, Nuevo Leon, México. Her husband is from Zacatecas and Jalisco. When her oldest started school at a Dual Language Magnet, Sara started teaching in her classroom. By then she had a broad understanding of how music impacted learning, and how it facilitated learning a second language and improved fluency. A parent, who she now considers a great friend recorded her so the kids could practice, and that recording became her first album “Canciones en español”. She now has 4 albums of music in Spanish. Her latest collection of songs was published by Scholastic for First 5 CA as a bilingual songbook. Currently, she teaches music in pre-schools, Head Start and Childcare Programs, and at the Elementary level. She has published 2 books for children and makes bilingual videos and music for children. In fact, she shared that children who enter kindergarten knowing at least 5 rhymes tend to have higher literacy levels. Those rhymes connect our children to their traditions and culture and are their first forms of storytelling. They build a child’s vocabulary and creativity. Music has now become a family affair. Her children have been learning music along the way and her daughters play Latin Percussion. Her oldest learned to play violin, guitar, and drums but now plays mostly clarinet and vibraphone. She believes learning to play music is like learning a language. She shared, "It just takes practice but anyone can do it!" While entrepreneurship found her, now she is grateful for the opportunity to know that she didn’t have to follow someone else’s footsteps. “My parents worked pretty much in the same jobs for their entire working careers. I look up to them. They showed me what it was to have a very strong work ethic and to work hard. But I wasn’t always that good at following rules, so doing my own thing suits me.” She wants to share with others now that you can make your own way too. She was candid in sharing that is still trying to figure things out too. Since she is musician we asked her about her musical inspirations. Her favorites include René Colato Lainez, a children’s author from El Salvador that has inspired her to continue to create while continuing to teach. Other influences have been José Luis Orozco, whose music has been so influential in the world of bilingual music for kids, and Ella Jenkins. More than anything she is continually inspired by the children she teaches. “They push me to do better, be funnier, and keep going,” she added. Sara is not done maximizing her impact! She is hoping to reach more people by creating more content and working with parents and teachers. She wants to empower parents and educators too. As her business has expanded Sara has also expanded her giving. In the Fall, Music With Sara classes will be part of family activities at Ascensia in Glendale, which offers transitional housing and homeless services. You can connect with Sara online and on her website.